CNC*Dnc is a low-cost DNC solution for use with single Machine-to-PC setups or machine cells utilizing AB style switch boxes. Users can add multiple programs into a file queue list. Provides first-in, first-out or manual override selection for program transfers. Features remote program request, file editing and automatic post-transfer view of associated PDFs. Queue multiple files for sequential or manual override of program transfers. Initiate queued list file program transfer from the CNC control. Automatically receive files into a pre-defined, machine specific Upload/Revision folder. Allows automatic saving of incoming NC files with an operator specified filename. Allows operator designated program request of NC files from the CNC Control. Automatically view PDF files associated with NC files. Instant preview of program contents during queue selection process. Use your own, third-party, editor to view or edit NC program data. Fully configurable RS-232 parameters and data flow control. Provides complete control of RS232 communications parameters, NC file program path, receive program path, and PDF document path, including end-of-block character and delay. 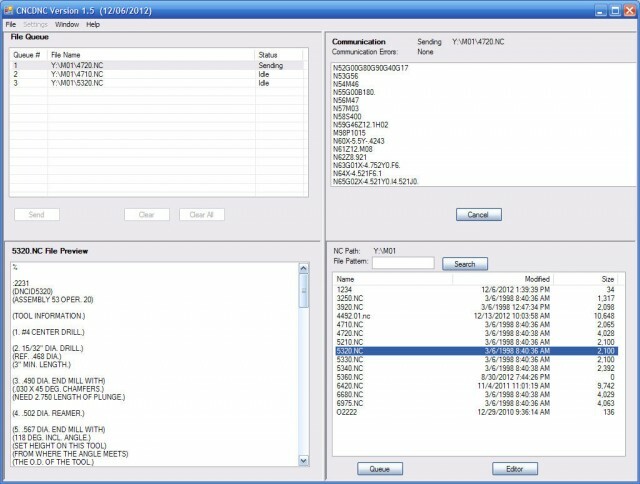 The above example demonstrates a remote program request for the program named 7777.01. If the requested program file does not exist, CNC*Dnc can optionally queue a user designated Remote Req. Err. Program–typically a dedicated program number as shown below. CNC*Dnc provides automatic viewing of PDF files, assisting operators with valuable setup, tooling, or historic information. The PDF document is displayed immediately after a program is transferred to the CNC control. PDF viewing is as easy as installing your favorite PDF viewer and then placing program specific PDF files in the PDF File Path. Download our free 30-Day trial or purchase a full license for just $399.95 US.